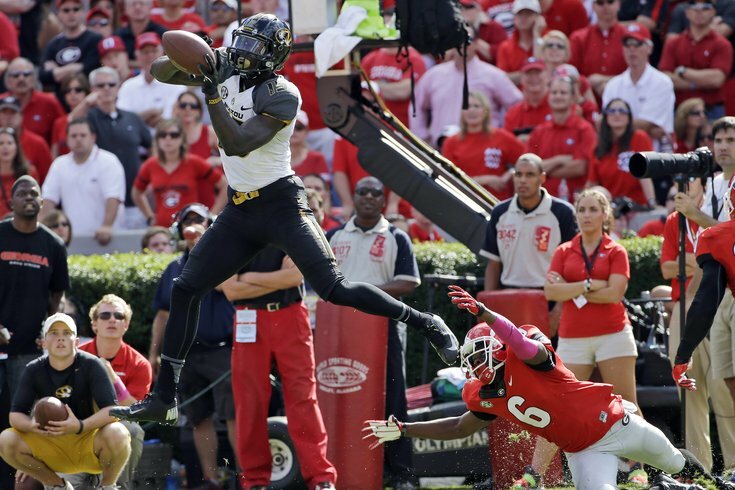 Dorial Green-Beckham is 6'5, 237 and runs a 4.49, but don't expect the Eagles to have much interest, because #culture. The NFL Combine is in the books, and we enter a short "dead zone" of the NFL calendar from now until free agency begins on March 10. We'll have more on the Combine this week, but here's what others are saying about the Eagles, post-Combine. One area that doesn’t generate a lot of buzz but deserves attention is the offensive line. The Eagles did not spend a single draft pick on a lineman last year, and as we’ve discussed, the current group is getting older. The roster lacks developmental prospects, and that needs to be addressed in late April. Which brings us to one name you should be familiar with: Oregon's Jake Fisher. Fisher (6-6, 306) showed good agility, leading all offensive linemen with a time of 7.25 seconds in the three-cone drill. He has the measurables (33 3/4-inch arms) to play tackle at the NFL level and has the athleticism to succeed in the Eagles' scheme. It would not be surprising at all if the Birds had him higher on their board than other teams. I couldn't agree more that the offensive line is an enormous need. The Eagles could only have one year until they have to replace multiple positions on the OL all at once, and they don't have many compelling options waiting in the wings. It is absolutely imperative that they begin to fill in some youth behind the vets on the roster. Just because the Eagles interviewed a player doesn't necessarily mean they're highly interested in that prospect. This is all just a part of the information-gathering process. With that said, here's what I tracked down. Click the link on the player for the source. Also, to note, players fielding questions at the Combine were often asked how many interviews they had scheduled, and many of they said they had in excess of 20. In other words, players talk to a lot of teams at the Combine. Still, when the Eagles whittle their draft board down, they'll be left with around 120-150 draftable names, so the players noted in BGN's post have at least not been taken off their board yet. From Zierlein's scouting report: Considered extremely coachable by scouts, who also love his willingness to play hurt. Very humble and leads by example. Family and heritage are extremely important to him. From Zierlein's report: Considered a problem child at Missouri. Suspended twice by Missouri and arrested twice for marijuana-related incidents. Kicked off team at Missouri in April 2014 after details of his alleged role in an alleged burglary were released by Columbia, Mo., police. He allegedly shoved a female student down some stairs during the alleged incident, but no charges were filed. ... It's easy to bet on the traits when a receiver has high football character and is a willing worker, but teams could pass on the traits early in the draft due to his perceived lack of work ethic and overall character. 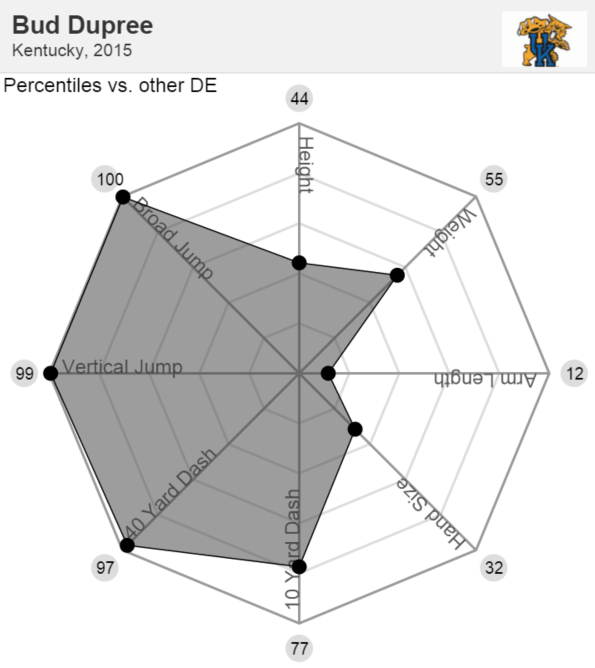 * Bud Dupree could be a guy that falls to pick 20. He measured in at 6-4, 267 and ran very well. He wasn’t able to do the on-field workout. You know the Eagles love that size/speed combo in an OLB. * I was disappointed in Trey Flowers. He looked more like a DE than LB. * Danielle Hunter is fascinating. He is 6-5, 252 and ran 4.57. He has 34 1/4 inch arms and 10 1/2 inch hands. This sounds like the body Chip Kelly would mold for OLB. Hunter isn’t instinctive or productive, though, and that makes him a bit of a risk. Good edge rusher might fall to Eagles at 20. There's Gregory, Ray, Fowler, Beasley, and Dupree. Will 5 go in the top 19? • We did an "Eagles only" seven round mock draft.